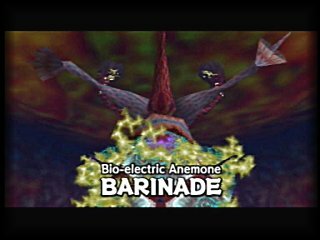 Quick Facts: The Barinade is the boss of the third dungeon in OoT. He has 10 Jellyfishes that protect his soft lower belly. Attack Pattern: This boss has several phases that have to be completed in order to take him out. With the three tentacles with a 'satellite' dish at the end he throws electric bolts at Link during the entire battle. Other than that he uses those 10 Jellyfish to attack you as well. This gigantic anemone is the cause of Lord Jabu-Jabu's strange behaviour. He has 10 Jellyfishes that protect him from sword attacks and he has leached onto Lord Jabu-Jabu using three tentacles, which he possibly uses to drain the fish's powers. After finding and losing Ruto and the Zora's Sapphire Inside Jabu-Jabu's Belly, Link ends up in a room of the boss of this dungeon. After the introduction scene the Barinade will immediately start attacking you with electric rays emitted from the three tentacles. Link now has to use his newly found Boomerang on the three connections Barinade has made with the ceiling. When all the tentacles are cut the giant Anemone starts to spin the first series of 5 Jellies around. After a while he stops doing this and again Link has to use the Boomerang to take out all five of these. The process repeats itself for the second series, until there are none left. After getting rid of all 10 of the Jellies, the final phase of the battle commences. Since you have stripped the boss from all his armor he will start spinning around very quickly and tries to hit you with his electric attacks all over the place. Again use the Boomerang to hit Barinade; this won't damage him but it will stun him momentarily. Applying several hits with the sword on the belly will make the boss retreat into Jabu-Jabu's skin, only leaving his indestructible upper part visible. Link has to dodge several electric beams again to make the boss' belly appear again. If this happens do exactly the same as before to deliver the final blow on him. The Barinade will self-destruct and leave a big green mess behind, among which a Heart Container and a portal appear leading you out of this dungeon. On a side note: It is possible to stop the spinning in the second phase a lot sooner, but you have to manage to hit the belly with your boomerang. The appearance of the Barinade has something in common with Arrghus, for they both protect their bodies by covering them with jellies. In the Palace of the Four Sword in ALttP for GBA, Arrghus protects himself with Bari, like Barinade. The German translator found it necessary to call this guy: "The Giant Jellyfish Barinade". This is contradicting to the title you see, when you enter the Boss Room: "Bio-Electric Anemone". This page was last modified on 16 February 2006, at 05:45.